Deadly Cairo Firebombing Attack Is Deemed Result Of A Fight : The Two-Way Police say the attack that killed 16 people followed a dispute between employees of the club and some young men. An Egyptian forensic expert checks the gate of the nightclub that was attacked in Cairo Friday. At least 16 people were killed in the attack. At least 16 people were killed and several others injured at a Cairo nightclub, after Molotov cocktails set fire to the club and restaurant early Friday morning. Police say the attack followed a dispute between club employees and some young men. "A statement from Egypt's Ministry of the Interior says following the argument, the young men threw Molotov cocktails into the club out of anger. "A raging fire broke out and smoke billowed from the club before security forces put out the fire. Police are searching for the perpetrators. "Authorities say this was not an act of terrorism. Essentially, it was a late-night bar fight gone very, very wrong." 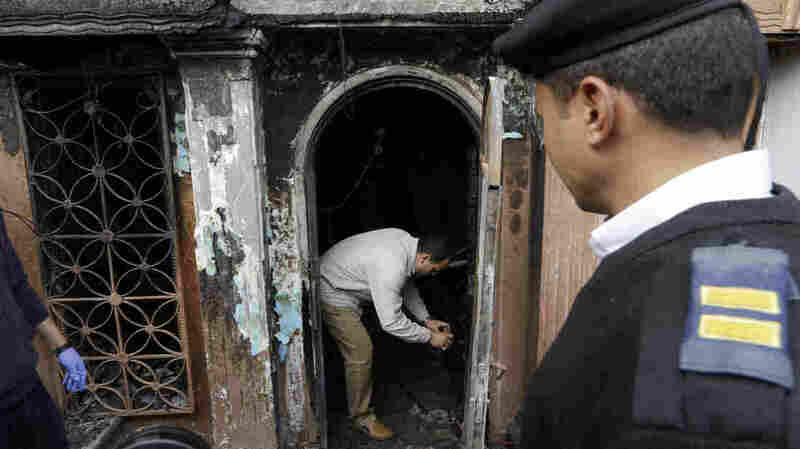 According to the Egyptian newspaper Youm7, masked men firebombed the club in the central Agouza district after they weren't allowed to enter. The club normally stays open through the night, the newspaper says. Video footage from the scene shows smoke and flames billowing out of the club's door in the early-morning daylight, as passersby gather at the business's basement entry door and attempt to use fire extinguishers against the blaze.